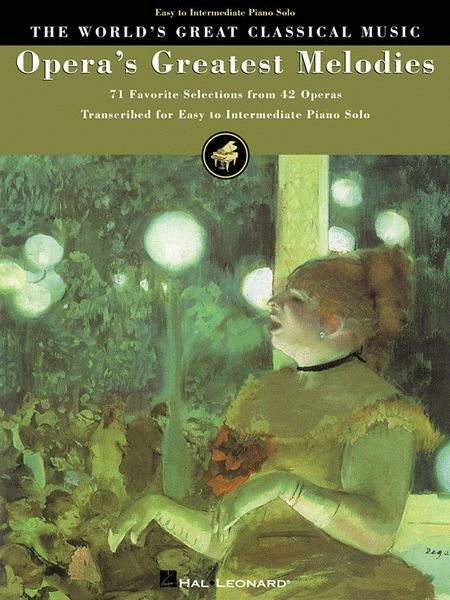 71 simplified selections from 42 favorite operas, including: Aida * The Barber of Seville * La Boheme * Carmen * Don Giovanni * Faust * Die Fledermaus * Madama Butterfly * The Magic Flute * Rigoletto * Tosca * La Traviata * and more. This lower intermediate-level book features complete plot notes and interesting facts about each opera. Chacun A Son Gout (From Die Fledermaus) Composed by Johann Strauss Jr. The Fledermaus Waltz (From Die Fledermaus) Composed by Johann Strauss Jr.
top quality music. the best ever.